Alicea Davis shares her God-given hope, strength and healing poetry with others to help move America forward in the much needed reconciliation process that will aid in more effective race relations. Davis personally relates to the current pain and anger that so many are facing due to racial unrest. As a young black woman, she experienced intense anger towards white Americans when she awakened to the reality of racism still existing in our society. While being burdened with fear and a deep sense of mistrust, she found herself in conflict with her faith, her upbringing and her joyful character. So she desperately prayed that God would give her the words to write that would restore her peace. Her healing from the pain of racism and oppression began years ago, while writing one of the poems within this book. As her healing went deeper, she wrote more poems. Today, she shares this compilation of her racial reconciliation poems to bring more healing to America. Beautifully printed in full color, each section begins with one of Davis’ insightful paintings which respresents her passion for human progress through abstract and symbolic art. 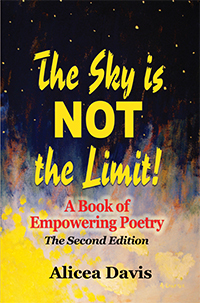 This original poetry book will help to prepare you to launch out towards the infinite possibilities in life!